ARM, HAND & FINGER PAINTING!!! MESSY BUT FUN! This is a given…Keep lots of water and paper towel nearby! 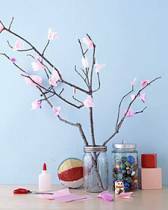 Glue twigs on sheets of sturdy white or light blue paper to make trees. You can use a variety of items for the cherries! Any of the following will work: small red circle sticker ‘cherries’–fingers tips dipped into red finger paint–the popped-popcorn as above image shows– or ‘pinched and squished’ tissue paper squares! 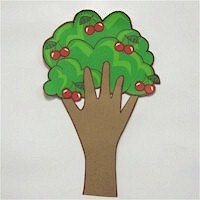 CONSTRUCTION PAPER – HANDPRINT CHERRY TREE…visit freekidcrafts for directions. When dry stick TP roll in the “pocket” and staple to make it tight around the “trunk”. 1. Mix the water and unsweetened drink mix together in a small bowl. 2. Pour blended mixture into containers. (Muffin tins or film canisters work well.) You can also mix other colors to use in your art. Gather branches that have fallen outside; let dry. Cut out 2-inch squares of pink tissue, pinch tightly in the center to create blooms; affix them to branches with white glue. Display in a tall container, such as a canning jar with the lid’s center removed. On finger-paint paper, draw or copy a lot of cherry stems. Using red finger-paint- have children use their thumbs to fill the page with “red cherries”! USING FACE PAINT– PAINT CUTE RED CHERRIES (adding a little brown stem and green leaf) on face and hands! 2. Add in a few drops of red food coloring that matches the flavor. Sprinkle CHERRY Kool-aid crystals onto a piece of paper. Cut some juicy red cherries in half. After pitting…use the cherry as you would a paint brush and draw on paper! A cherry pie eating contest would be expensive for a classroom or program–but how about a few cherries under a pile of whipped cream! Also great fun at home or a party!!! Put two or three maraschino cherries on each plate and cover it with whipped Cream. Children then use only their mouth to pick up and eat the cherries. The first child to do this wins! PUT THE CHERRY ON THE SUNDAE! Instead of Pin the Tail on the Donkey-play- Put the Cherry on the Ice-Cream Sundae. Make a large picture of an ice-cream sundae. Also make a paper cherry for each player. Proceed exactly as in playing Pin the Tail on the Donkey. One by one, blind fold the players as they try to ‘top’ the center of the sundae! The closest one wins. How far can you launch a pit? 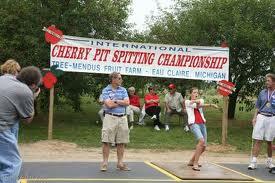 Believe it or not…The Guinness World Record for competitive cherry-pit spitting is 93 feet 6.5 inches! Great fun for adults too!!! #1. Give each child a paper cup with their name written on it. As a snack, give them several cherries and save their pits in the cup. When the contest is later held–their alloted supply of pits is ready to go. #2. Give each participant three or four cherries. One by one they eat the cherry and then spit the pit. Mark off the game area every 3 to 5 feet. This will make it easier to determine the winners. Pits can shoot an amazing distance! As an example–each year the city of Traverse City, Miching holds their Cherry Festivival. ‘Pit Spitting’ is one of the annual events. Men’s pits usually travel an average of 55 feet, women’s 35 feet and childrens’ have flown 40 some feet. Pit Spitting is a practiced art. Allow children to practice before the event begins! Go over rules before the event begins! Like so many goodies, cherries have entered our common language in an important way: beautiful and delicious! They’ve become synonymous with the best of the best. 1. Cut Twinkies in half. Arrange in a single layer in bottom of pan or large glass bowl. 2. Mix pudding according to package directions. Pour pudding over Twinkies. 3. Spoon cherry pie filling over the pudding layer. Smooth the pie filling layer. 4. Top with Cool whip. Yumm! CHERRY-PINEAPPLE DUMP CAKE Easy and good! Grease 9×13 pan. Dump in pineapple with juice, spreading evenly. Pour cherry pie filling over pineapple, spreading evenly. Add dry cake mix evenly over fruit. Add nuts. Drizzle melted butter over top. Do not mix. Bake 350 degrees for 1 hour. THE ABOVE DESSERT USING THREE INGREDIENTS! Layer the ingredients in a 13×9-inch baking pan in the order given. Bake at 350 degrees about 40 minutes or until; topping is golden. Serve with a dollop of whipped cream/topping or ice-cream. Follow package directions on pre-made pie crust… then fill it with Cherry Pie filling! Place cubes at the bottom of each cupcake holder. Plop a spoonful of cherries on top of the cubed cake pieces. Put chocolate chips in a medium saucepan with a heavy bottom. Heat over low heat, stirring constantly, until chocolate is melted. (The chocolate can also be melted in the microwave.) Remove from heat. Recipe Source: Cherry Marketing Institute. Make Cherry Jello using only 1/2 of the recipe directed amount of water. Refrigerate Brie until chilled and firm; or freeze 30 minutes, or until firm. Cut Brie in half horizontally. Combine butter, cherries, pecans and thyme in a small bowl; mix well. Evenly spread mixture on cut-side of one piece of the Brie. Top with the other piece, cut-side down. Lightly press together. Wrap in plastic wrap; refrigerate 1 to 2 hours. To serve, cut into serving size wedges and bring to room temperature. Serve with crackers. Preheat oven to 350 degrees. In a large bowl, mix together the vanilla, butter, egg yolks and brown sugar until creamy. Add the flour and salt and mix well. Have the children roll the dough into 1″ balls and place them on greased cookie sheets. Have the children make a thumbprint in each ball and then place a maraschino cherry in each thumbprint. Serve scoops of vanilla ice-cream with a spoonful (or two) of cherry-pie filling. Make Peanutbutter and Cherry JELLY/JAM SANDWICHES–cut with cute cookie-cutters if desired. Combine the first three ingredients by mixing slowly so as not to disturb the bubbles in the soda. Pour in tall glass over ice and top with Maraschino Cherry. Squeeze lime juice into a tall glass. Add soda and cherry juice and stir well. Add a maraschino cherry on top! In a large pitcher, combine hot water and sugar; stir until sugar is dissolved. Add cold water, lemon juice and cherries with their juice. Mix well. Serve over ice. There are more than 1,000 types of cherries and are grown in 20 countries. Practically all cherries fall into just two categories–either sweet or sour. (P. avium -sweet cherries and P. cerasus-sour cherries) The number of cultivated cherry varieties worldwide is now estimated to be about 900 for sweet and 300 for sour. Cherries are from the Rose family and are related to plums, peaches, apricots, and almonds. Bing cherries are the best-known variety of a sweet cherry. 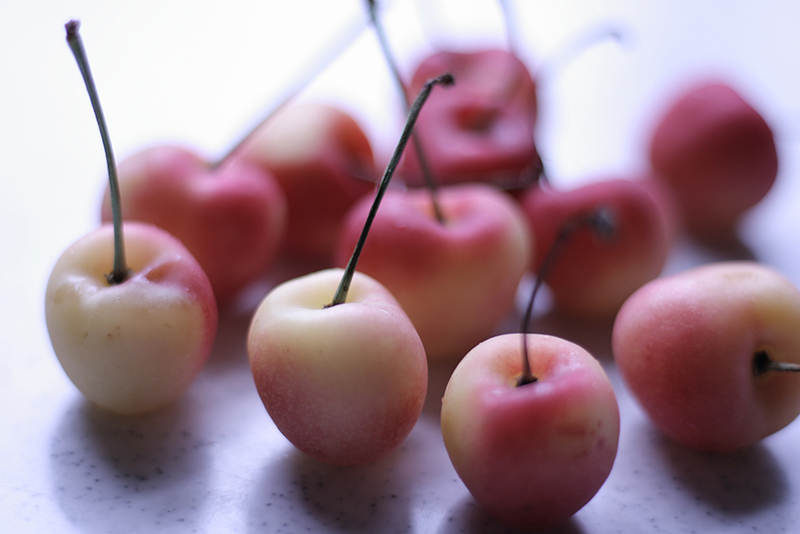 Rainer cherries are sweet with a yellow or pinkish skin. They are milder and sweeter than the bing but are grown in limited quantities. The montgomery cherry is the best-known sour cherry, and is mostly used for pie filling or sauce.They are grown mainly in the eastern and midwestern states. Cherries are a good source of Vitamins A and C and potassium, and sour cherries are higher in Vitamin C and Beta carotene. Cherries have a very short growing season and can grow in most temperate latitudes. The peak season for cherries is in the summer. In the United States, there are more than 1,000 different varieties of cherry trees, almost all of them blossoming over a three-week period in late May and early June. Of those 1,000, about ten varieties are produced commercially and are put to good use. Every tree produces about 7,000 cherries–which is about thirty pies each! In many parts of North America they are among the first tree fruits to ripen. Cherry juice stains hands, table linens and clothing. For stained hands, rub lemon juice over the affected areas and rinse well with warm water. For fabric, apply a commercial brand of stain remover directly to the stained portion of the material, follow directions and repeat as necessary.